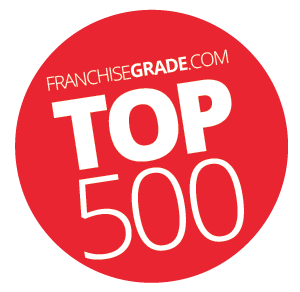 Welcome to The Franchise Grade® Top 500 list for 2016! For our assessment of 2,387 franchise systems, we used our exclusive Franchise Performance Index™ data analysis tool to determine the relative grade of each system and its ranking in our Franchise Grade® Top 500 index. Our primary focus in applying the FPI is to understand and quantify investment risks for prospective franchisees. You can learn more about each franchise system by clicking on the links below. Do not rely on The Franchise Grade® Top 500 for your investment decisions. The graded rank within the Top 500 is not a recommendation or endorsement of any franchise system. It is based solely on specific variables and risk factors contained within our Franchise Performance Index for a given time period. These variables and risk factors may not be those you as an investor deem measurable and you should perform your own due diligence to ensure any specific franchise investment is right for you. We strongly recommend you seek professional support and legal advice prior to investing your money.